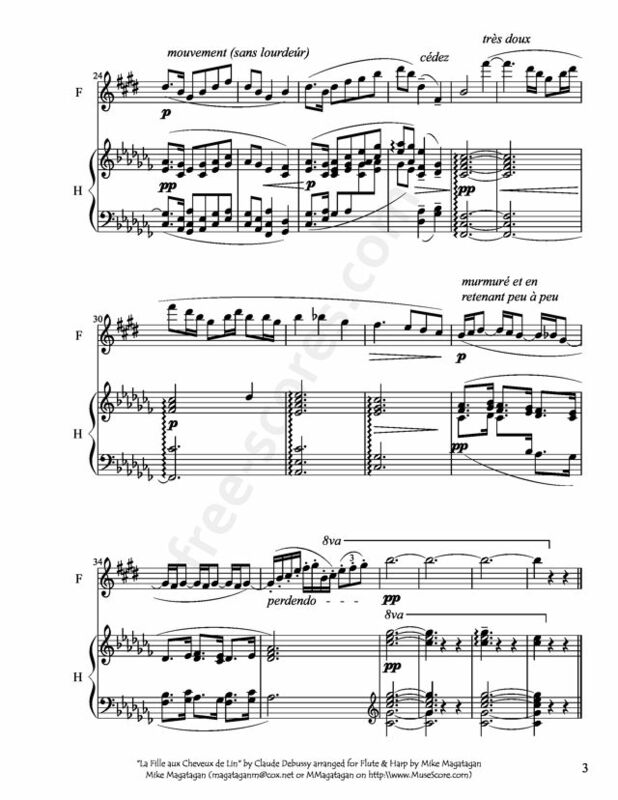 The eighth number in Claude Debussy's first book of piano Preludes, a volume the composer worked on between about 1907 and 1910, is the celebrated "La fille aux cheveux de lin" (The Girl with the Flaxen Hair), two pages of delicate, superbly-crafted music that rival the Clair de lune from the Suite bergamasque and the Prelude to the Afternoon of a Faun as the most widely recognized entry in the composer's catalog. One of Debussy's happiest decisions when composing his Preludes is, sadly, one that has been all but undone by publishers. Nowadays one finds the Preludes' picturesque little descriptions (such as "girl with the flaxen hair") at the top of each piece in bold, assertive type. 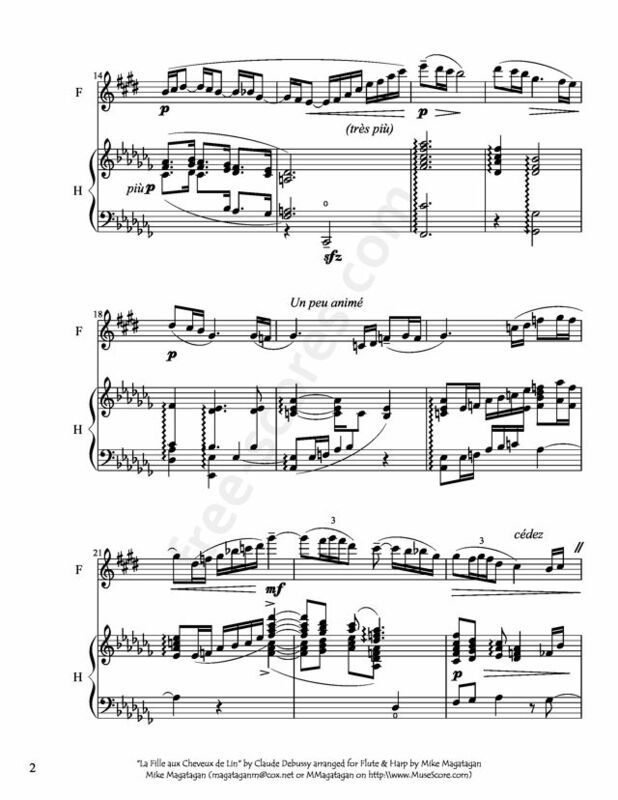 When Debussy put the pieces to paper, however, he placed the descriptions at the end of each piece, as hints, even questions -- these are not the miniature, concrete-subjected tone poems we are sometimes led to believe. Indeed, the title La fille aux cheveux de lin is so famous that it can sometimes distract from the fact that the piece is as perfectly poised and flawlessly balanced a work of piano music as one might hope for. The unaccompanied melody at the opening glistens (it is really just an arpeggio, so guilelessly drawn that one marvels at the effect it has). The mild climax in the middle of the piece is fine china -- radiant but ever so brittle, always in danger of being irreparably cracked or even smashed by an over-zealous pianist. The uncertain parallel fourths of the final pianissimo "murmuring" (called thus by Debussy) are turned on their heads after four bars, rising up into the warm sun of one last sonorous G flat major chord. 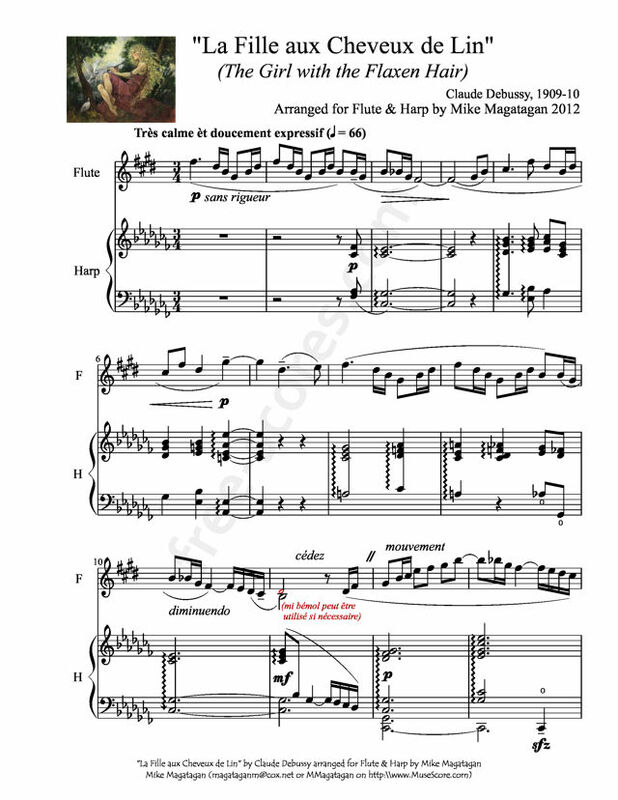 Although originally written for Solo Piano, I created this arrangement for Flute & Harp. magnifique !mais j'ai un faible pour CLAIR de LUNE!!! Dank je Jenne Van Antwerpen voor de suggestie voor maatregel 11 en de correctie op maat 28! Thank you Jenne Van Antwerpen for the suggestion for measure 11 and the correction on measure 28! 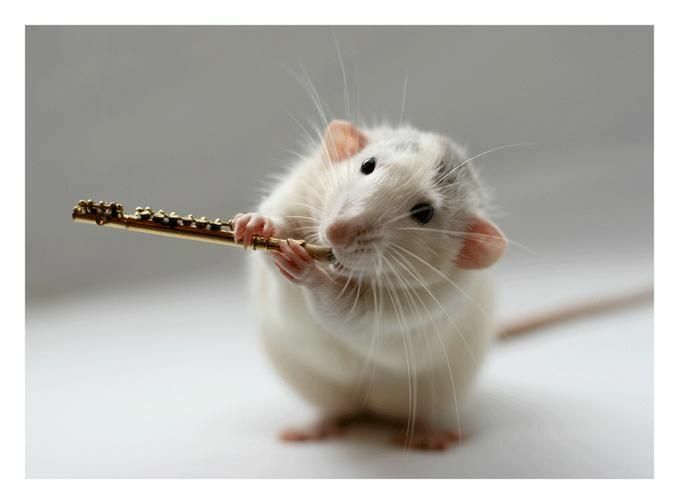 prachtig,maar je hebt een concertfluit nodig om het te spelen,tenzij je de do in maat 11 vervangt door een mi(in de ander versies die ik heb is het ook een mi)In maat 28 heb ik de la ook vervangen door een do.Heel goede oefening om eens met 7 bémols te spelen,bedankt!